It is indeed tragic that such could happen in this country. 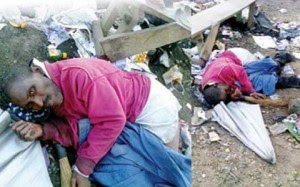 What exactly happened to Dr. Olawunmi Thorpe, an Ogun State indigene, who died a homeless man, may never be known. Thorpe had a Bachelor and Master’s degrees in Mass Communication and a PhD in English Language. All these information came to light when the Punch got information that the “mad man” who spoke impeccable English had died about 5pm Wednesday last week. When the two men were asked how they knew Thorpe and their efforts at helping him before he died, Happiday said he first met the deceased about a year ago. On his part, Mr Olawale explained that he first met Thorpe about four years ago. According to him too, the homeless man always asked him for a Bible. He said, “I felt the place was not safe and he could still become something great if he got somebody to take care of him. He brought out a jotter containing phone numbers of some of his friends and relatives and he gave me that of a man he referred to as his uncle and head of the family – Bode Thorpe. According to Olawale, Thorpe told him there was a case of financial impropriety in the bank, resulting in his being jailed. Thorpe was said to have explained that after he left jail, he had a road accident that affected his right leg.